Furby has been difficult to locate in stores for many since early November 2012 with people asking "where can I find a Furby? ", however the last few days has seen the situation worsen with all the retailers we track showing very little or no stock. Between the 14th November and 27th November the popular high street chain Argos had been granted exclusive sales by Hasbro of 4 new colours (Midnight Blue, Pink, Purple and Green). We have been monitoring stock levels since and at the time of writing only a handful of stores currently have stock. 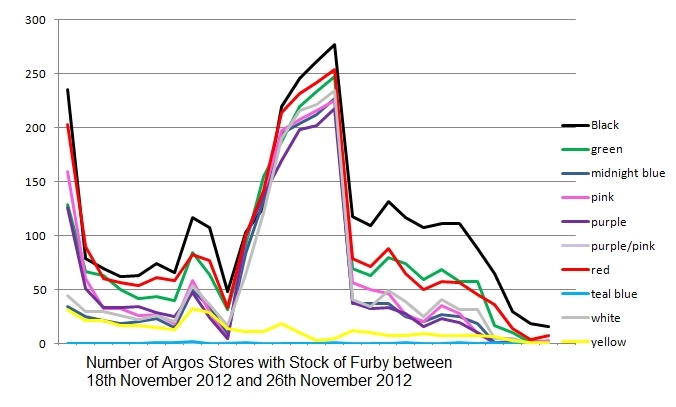 The graph below shows the number of Argos stores which had stock between 18th November and 26th November. As you can see there was a spike of new stock on the 22nd November which has now dwindled to just a very few stores. Also bare in mind that Argos has just under 700 stores throughout the UK and even this spike in availability only saw around a third of stores obtaining fresh stock. You can check availability in your area at our Argos Furby Stock Checker which when left open will also provide alerts. The good news is that other retailers will now also be able to sell the four new colours which we are predicting should see a marked increase in stock this week. Tesco Direct have already pre-empted this today by adding stock to their website and we are expecting others to follow soon. The previous most popular Furby colours were Teal/Blue and Purple/Pink and many people have been asking us when these will be back in stock. Unfortunately with no official word from Hasbro we just don't know when or even if these will be available again with the four new colours now being fully introduced, however it is now likely that these shortages will continue until Christmas. For full details of current online stock levels see on our Furby Stock Checker webpage.